Jaime Herrera kicks Week 29 off, following his assignment to New York City versus Chicago Fire on Friday night. Craig Lowry, Andrew Bigelow and Robert Sibiga complete the crew for the 8pm ET kick-off. Seven games follow on Saturday, with 2015’s MLS All-Star referee Ismail Elfath taking the whistle for the first of those, a 5pm ET kick-off between Toronto FC and Philadelphia Union. Two hours later, and three more games get under way. Jorge Gonzalez, Sorin Stoica and Baldomero Toledo are the experienced trio in charge, boasting numerous Cup, Playoff and All-Star honours between them. For Gonzalez, who refereed the All-Star game in 2010, it’s New York Red Bulls at home to Montreal Impact. 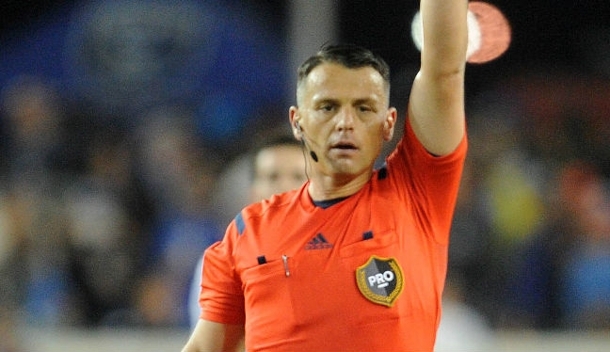 Stoica, who was on fourth official duties in last week’s US Open Cup, has been assigned to the center for D.C. United versus Orlando City, while Toledo – who refereed the showpiece in Texas – is in the middle for the clash between Vancouver Whitecaps and Colorado Rapids. Houston Dynamo and Real Salt Lake are both at home, and the two clubs were involved in the latest Play of the Week, where PRO’s Training and Development Manager Paul Rejer takes a look at a dropped ball incident from the Week 28 encounter. Juan Guzman is the referee in Texas for Dynamo’s meeting with Portland Timbers, while Jair Marrufo is center referee for RSL’s match-up with the newly-crowned US Open Cup champions, FC Dallas. Saturday’s action will be brought to a close by Edvin Jurisevic, and his crew of Adam Garner, Jeffrey Greeson and fourth official Alex Chilowicz. They’ll oversee the game between San Jose Earthquakes and Sporting Kansas City at 10:30pm ET. A double-header on Sunday rounds off Week 29, with current MLS AR of the Year, Corey Parker, running the line in LA Galaxy’s match-up with Seattle Sounders. Kyle Atkins will be opposite, with Armando Villarreal in the center. Columbus Crew versus New England Revolution is the week’s final game, with 2016 All-Star referee Chris Penso the man in the middle.